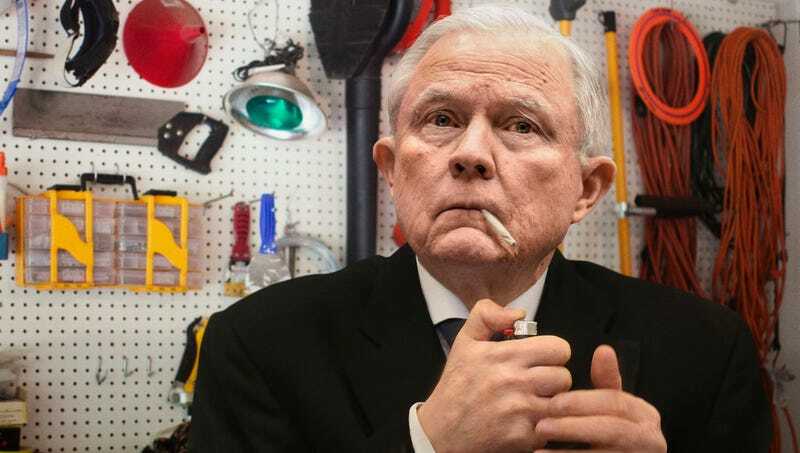 WASHINGTON—Following months of bruising criticism from Democrats and President Trump alike, an inconsolable Jeff Sessions was reportedly trying to commit suicide Thursday by smoking a joint. “I swore I’d never take the coward’s way out, but what choice do I have?” said a teary-eyed Sessions, carefully laying a sealed envelope containing his farewell note on a tool bench in his garage as he raised a lighter to the marijuana cigarette with trembling hands. “This is it. I’ve taken four puffs to make sure there’s no chance of survival. It should only be a matter of minutes now. He coulda done that 2 years ago as far as i'm concerned. Well.....at least at the DoJ, while he was Attorney General, the twalet were never cleaner. I think Pepsi forgot his fake news checker. It is impossible to commit suicide by smoking a joint. The jackass should hide his head in shame for his incompetence and dishonesty. Say it ain't so, Pepsi. Why?? Cannabis cures, it does not kill!! Page created in 0.918 seconds with 31 queries.